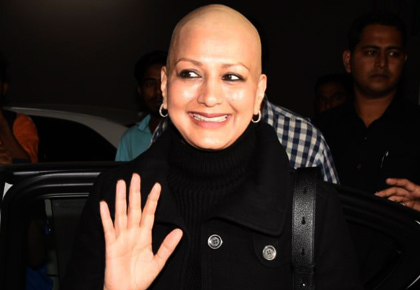 Sonali Bendre returned to India after being treated for high grade cancer in New York. 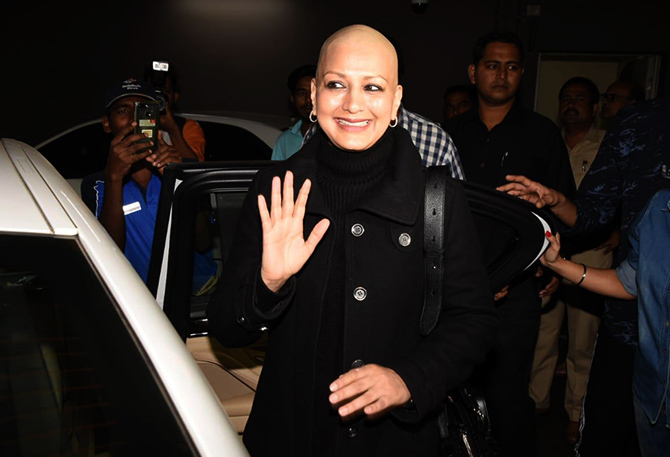 The actress was seen at Mumbai airport along with her husband Goldie Behl. While she's back home, Sonali says the treatment is not over. Sonali has kept everyone updated about her condition on Instagram, posting pictures and information about herself from the time she made the announcement in July. And she updates us again: 'They say Distance makes the heart grow fonder. It sure does. But let's never underestimate what distance teaches you. Being away from home in the city of New York, I realized I was walking amongst so many stories. Each trying to write their own chapter in different ways. Each struggling to do it but never giving up. Each taking it #OneDayAtATime'. 'And now I am on my way back to where my heart is. It's a feeling I can't describe in words but I'm going to try -- it's the joy to see my family and friends again, the excitement to do what I love and mainly the gratitude for the journey I've had up until this moment'. 'The fight is not yet over... but I'm happy and looking forward to this happy interval :) It's time to learn that there is a new normal out there and I can't wait to embrace it and #SwitchOnTheSunshine. #NowPlaying #AdventureOfALifetime'.